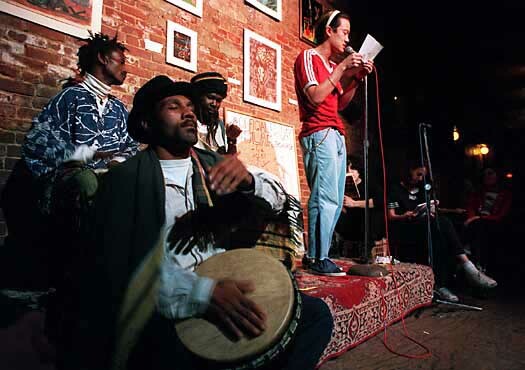 “Poets read at the Nuyorican Poets Café in New York, 1995.” Hispanic American Almanac: A Reference Work on Hispanics in the United States. Ed. Sonia Benson. 3rd ed. Detroit: Gale, 2010. Student Edition. Web. 1 Feb. 2013. To locate poetry books in the library, search the 811s or check the AHS Online Catalog. Student Resources in Context includes a Literature and Arts Center with biographies of authors and poets, creative works, and multimedia resources. Britannica School is on online encyclopedia that includes biographies of poets and authors from ancient times to the present; includes images. WebPath Express is a feature of the AHS Online Catalog that enables students to search for reliable web sites. SweetSearch is a search engine for students in which every web site has been evaluated by research experts.